Endives goes very well with blue cheese and this tapa is really good tasting. The dish is easy to prepare and may also be served as a snack with a glass of wine. 1/2 cup mayonnaise, natural yoghourt or crème fraiche, or half of each. Rinse the endives, separate the leaves and arrange them on a serving dish. Mash the cheese, then add the mayonnaise/yoghourt/cream and mix until smooth and creamy. 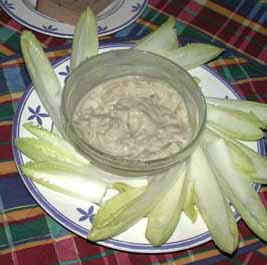 Stuff the endive-leaves with the cheese-mixture or fill a bowl (see photo above) and put it in a middle of the serving dish and arrange the leaves around the bowl. Then the guests can dip the leaves in the cheese. Sprinkle paprika on the top. 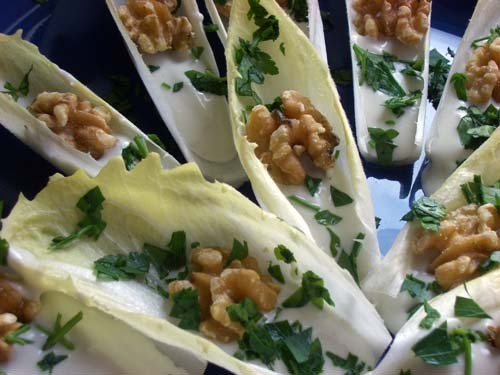 As an alternative the endives can be filled with blue cheese before serving them. On the photo above with walnuts and chopped parsley on the top.